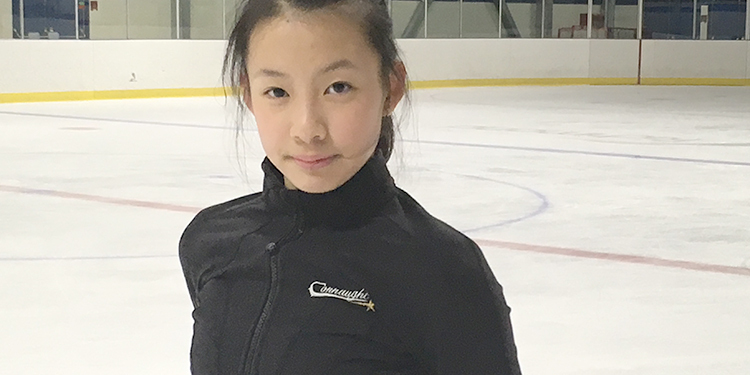 Richmond High's Annie Lin, who trains with the local Connaught Figure Skating Club, is competing for Chinese Taipei at this week’s ISU Junior Grand Prix at Minoru Arenas. Skaters from 24 nations are competing, including many of the stars of tomorrow. The next wave of figure skating has come to Richmond. Many of the sport’s stars of tomorrow are competing at the Junior Grand Prix of Figure Skating, hosted by Skate Canada in partnership with the International Skating Union, through Saturday at Minoru Arenas. With the ladies’ free skate programs set to begin at 2 p.m. this afternoon (Friday), a pair of Russian skaters sit first and second. Having earned 65.07 points during Thursday’s short program, Anna Shcherbakova is less than a full point ahead of teammate Anastasia Tarakanova who was awarded a score of 64.56. The pair are ahead of two Korean skaters, Jihun To and Young You, themselves separated by less than a 10th of a point. Canada’s top skater is Hannah Dawson who sits ninth after earning a score of 54.02 in the short program, while Canadian junior silver medallist Sarah-Maude Blanchard, 17, of Quebec is 11th (50.67 points) after the short program. Yu-Hsun (Annie) Lin, who trains at Richmond’s Connaught Figure Skating Club, is representing Chinese Taipei at the competition. She sits 18th after a solid short program garnered her a score of 36.77. Tomoki Hiwatashi of the U.S. leads the men’s standings after the short program, after judges awarded him a score of 76.81 points. Japan’s Yuma Kagiyama is second and Canada’s Iliya Kovler third. Skating for Canada, Richmond’s own Beres Clements is a strong ninth going into Saturday’s men’s free skate, scheduled to begin at 12:30 p.m. The former Connaught skater who now trains with Joanne McLeod at the Centre of Excellence in Burnaby, earned a score of 60.78 in the short program. Clements placed 12th at his first ISU assignment of the season in Austria. Current Connaught skater Micah Kai Lynette, who resides in Bellingham, Wash., sits 12th after scoring 58.27 points. Lynette is representing Thailand. After earning gold at his first ISU assignment last month in Slovakia, Stephen Gogolev, 13, of Toronto sits seventh after the short program with 63.63 points. He is coached by Brian Orser and Lee Barkell. Today (Friday) also marks the ice dance competition at 7 p.m., and features two-time Canadian junior champions Marojie Lajoie, 17, and Zachary Lagha, 19, both of Quebec. The duo was fourth at the 2018 world junior championships. Canadian novice silver medallists Miku Makita, 15, of Anmore and Tyler Gunara, 16, of Burnaby are also set to compete. The event concludes with the junior pairs free skate at 4 p.m. Saturday. Canadian junior pairs silver medallists Patricia Andrew, 13, of London, Ont. and Paxton Fletcher, 19, of Rodney, Ont. will be among the competitors. The pair was fourth at their first assignment in Slovakia earlier this season. Tickets, $10, are general admission, and free for children 12 and under.